Core retail sales fell steeply between mid-2008 and mid-2009 but have since staged a recovery to pre-recession levels, with further gains anticipated through the holidays. Despite this consumption recovery, vacancy rates at retail properties remain significantly higher than the levels recorded prior to the recession. This reflects record store closures and the housing-inspired run-up in retail construction. Hundreds of millions of square feet were delivered just as consumers pulled back, but a dramatic shift in consumer behavior also impacted vacancy trends. While monthly core retail sales have surpassed previous peak levels, nearly one-third of the recovered gains have come from e-commerce. 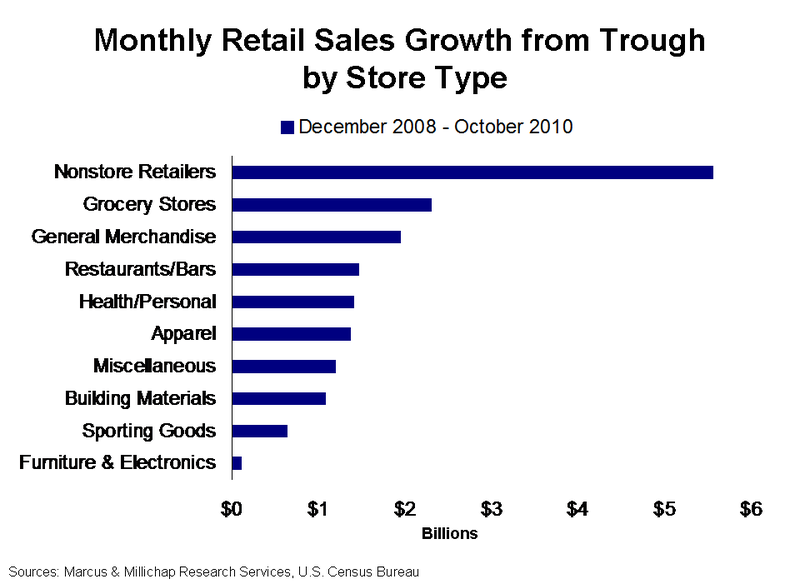 Since the trough in monthly retail sales in December 2008, online retail sales climbed nearly $5.6 billion at the expense of many traditional retailers. Drugstores, grocery stores, and restaurants and bars also account for outsized shares of the increase, while clothing stores, building supply dealers and furniture retailers posted the weakest gains. The recession has given way to a structural shift in shopping behavior that could change the retail landscape for years to come. As job losses mounted and budgets tightened, consumers became more price-conscious, and many discovered lower-price alternatives, such as discount chains and online stores. As the economic recovery gains momentum, consumers may have little incentive to revert to previous shopping habits. While major discount chains will continue to expand, more mom-and-pop retailers, which have already lost sizable market share, will be pushed to the edge. Marginal chains and those that fail to offer a competitive advantage to brick-and-mortar powerhouses or Internet-based services, such as movie rental chains or music stores, will also face steep challenges. Forecasts call for a 2.5 percent to 3.0 percent gain in holiday spending this year, up from a modest increase in 2009 and a decline in 2008. Strengthening consumption trends advanced GDP growth to 2.5 percent in the third quarter, a positive trend for retailers. Optimistic consumer surveys support improved holiday retail sales; however, web-based shopping will account for a significant share of the increase. Black Friday will compete with Cyber Monday for top gains this year, and the outcome could be an important signal for retailer trends as the economy strengthens. Shifting shopping habits and a choppy start to the recovery have given way to changes in the retail landscape. This year, major national retailers have increased their pop-up store counts significantly, with Toys R Us now operating 600 temporary locations, up from 90 stores in 2009. The addition of national chains to the pop-up store roster has considerably expanded this retail niche, which was once dominated by bare-bones operations selling seasonal wares. Retailers are taking advantage of opportunities to pick up space in desirable shopping centers and malls that may have been cost-prohibitive just a few years ago. Though pop-up stores will not drive a recovery in property operations alone, they should help pad NOIs through this holiday season and may ultimately lead to some longer-term leases. This holiday season will be better than the last few, but it will likely take several more quarters for consumers to entirely shake off the effects of the recession. During the third quarter, retail vacancy retreated 10 basis points to 10.2 percent, the first decline recorded since mid-2005. Nonetheless, the vacancy rate remains near its highest level in approximately 18 years and will likely fluctuate in the near term as employment growth returns slowly. While the retail sector should post improvements in late 2011 as economic growth accelerates, meaningful gains in occupancy and rents remain unlikely until 2012. This entry was written by marcusmillichap, posted on November 25, 2010 at 12:24 am, filed under Research and tagged retail black friday ecommerce cyber monday. Bookmark the permalink. Follow any comments here with the RSS feed for this post. Trackbacks are closed, but you can post a comment. The only reason retail has staged a so-called recovery is because prices are deflationary. margins have been cut to the bare minimum. Discount stores have lead the way. The only reason consumers are buying is because their dollar goes anywhere from 10% to 40% further than 2008-2009. it is RIDICULOUS to believe that retail is actually recovering. The U.S. has a 21% unemployment rate. Please, stop the rhetoric and the regurgitation of bs data.